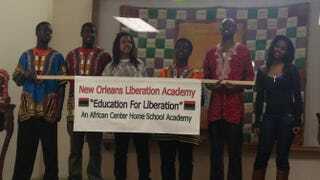 Students at a fundraiser for Liberation Academy in New Orleans on March 14, 2014. Some of the students who led protests over the district’s Collegiate Academy charter schools withdrew from those schools and enrolled in Liberation Academy, founded by parents and local activists. The scant mention of Democrats’ official platform on K-12 education on the main stage at the Democratic National Convention last week was clearly a political effort to distance the party from the fray. Democratic presidential nominee Hillary Clinton has backed off many hallmarks of the accountability era that started with the passage of No Child Left Behind in 2001 under the first George W. Bush administration and ended when that law was replaced with the Every Student Succeeds Act last year. Many approaches, like teacher evaluation, simply did not work and caused irreparable harm to teachers and children. Others, like charter expansion and school closures, did not live up to the promise Clinton hoped for. Let’s create a system rooted in the people who need change the most. Let’s adopt a philosophy centered on black and brown people. Freire believed that transformation requires an educational system rooted in the people who need change. The choice movement, for instance, will always fall short in urban areas because the system of thought wasn’t centered on black or brown worldviews. Adam Smith, forefather of the political economy, might appreciate the choice- and standards-based curriculum movements that emphasize competition, productivity and rugged individualism. Filtered by the works of Milton Friedman, the educational-choice movement in particular has been applied so loosely that basic ethics and notions of fairness have been trumped by stereotypical corporate values that fly in the face of what black, brown and girl students need. First “poverty didn’t matter.” Then, all of a sudden, it did, and schools needed wraparound services. The race of the teacher didn’t matter. Now reform organizations are looking for black and brown teachers and leaders en masse. (For the descendants of slaves, “human capital” problems take on a whole different meaning.) Expulsion and suspension were a necessary evil in order to develop a positive school culture. Now we need restorative-justice programs. All of the aforementioned mistakes were predicted, aired and fought and could have been avoided. But the fidelity to ideology evidences the stubbornness of white privilege that comes out of a Eurocentric model. The inefficiencies of white privilege cost us so much more than dollars. With every reform from the choice frame, we add to the bureaucracy of white institutions built to help black communities. Consequently, each institution and approach attempts to reform the prior without questioning the bedrock on which they were all built upon: white supremacy and patriarchy. After every iteration, the only remaining factors are the base ideology and system of oppression. Let’s stop patching the previous error. If we can build a reform approach and invest billions around a white male, we should be able to do so around Afrocentric people and philosophies. Black and brown folk don’t need “reform.” We need an alternative that we define.